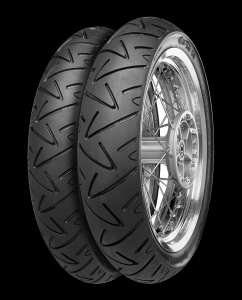 Hypersport road and track tyres for 50cc to 250cc motorcycles. The ContiTwist SM and ContiTwist SM Sport provide riders of smaller capacity machines with the perfect blend of performance and style, with our unique tread pattern which mirrors the world conquering ContiRoadAttack radial in both design and appearance. Both versions of the tyre use our unique Advanced Silica Compound for super fast warm up and superb all weather grip.